This week we explore the problem of phenolic (and tannin) flavors in beer. Phenolics are usually considered an off flavor, though in some beer styles they may be desirable at low levels. This week’s article is part of my ongoing series on off-flavors in beer including the previous articles on Diacetyl, DMS, and Esters as well as my article on judging beer. Phenolics cause some confusion because they can introduce a variety of flavors to home brewed beer which vary from clove and banana at the low end to spicy or smoky flavors or even medicinal or band-aid like flavors in the extreme. In certain styles, notably German weizens and many Belgian beers the clove flavor can be desirable, but in most beers phenolics are considered a flaw. Phenols or phenolics are chemical compounds similar in chemistry to alcohols (though not alcohol) that tend to be highly acidic. In fact some phenols are actually used as cleaning agents. They come in many varieties (polyphenols, chlorophenols, etc…), which is why they can drive several different off flavors in beer when present. Phenolics are naturally produced by many yeast strains during the fermentation process, with some Belgian, German and British yeast strains being higher level producers. Another common source of phenols are wild yeast strains, which often contribute band-aid like flavors. Because phenolics are produced by most yeast strains, they are present to some degree in any beer. However several key points in the brewing process and ingredient selection can drive how bad your phenolic problem will be in the finished beer. First, the use of chlorinated water for brewing is a bad choice. If you have water that is highly chlorinated, the chlorine will react with naturally occurring phenols in your beer and produce chlorophenols which have a very low taste threshold and are instantly picked up as a flaw when tasting. Chlorophenols manifest themselves in the finished beer with a strong band-aid or even diaper aroma and flavor. Even if your regular tap water is relatively free from chlorine, you need to be aware that most US water sources are flushed about once a year with higher levels of chlorine to purge the system. If you happen to brew during that week, you may get a strong band-aid flavor. Using bottled RO water is a good alternative. Finally if you use chlorinated cleaning agents, such as bleach, you need to be thorough in rinsing your equipment before use as this can also introduce chlorine to the beer. Another form of phenol is called polyphenols, which are more commonly called tannins. Tannins (polyphenols) tend to manifest themselves as an astringent or bitter flavor in the finished beer, and may also lead to a permanent haze or chill haze (haze that shows up when the beer is chilled). Tannins can be extracted by oversparging (continuing to sparge too long when mashing), sparging at too high a temperature (greater than 170 F or 77 C), or mashing at too high a pH level. pH levels above 5.5 are particularly prone to tannin extraction, with 5.1 or 5.2 being an ideal pH level during the mash. Any of these can lead to cloudy beer, chill haze and an astringent or bitter flavor in the beer. As mentioned in the introduction, all yeast produces phenolics to some degree, but some yeasts are more prone to phenol production. In particular wild yeasts and Belgian yeasts tend to produce high levels of phenols in the finished beer. At low levels this manifests itself as a clove like flavor that is desirable in many Belgian beers as well as the classic German hefeweizen. However, if too many phenols are present it may morph into a smoky or spicy flavor or even the dreaded band-aid flavor. 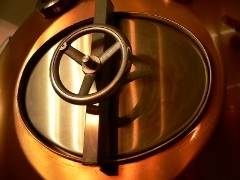 Altering your yeast may be a good choice if you have a phenolic batch. Also be careful not to introduce wild yeasts which tend to produce very high phenolic flavor concentrations. In addition to wild yeast, many other wild organisms produce phenols including algae and bacteria. So if your water source is of questionable quality or from a surface source such as muncipal streams and lakes you may want to consider using bottled RO water for brewing instead. Bacterial infection can also produce a strong phenolic flavor, often in combination with sour off flavors. 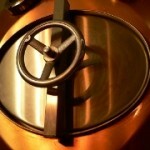 This can often come from infection of hoses, valves and taps used in brewing or serving the beer. Phenolics can be one of the toughest flaws to properly diagnose because, as noted above, they manifest themselves as several different flavors and also have a variety of possible root causes. The critical areas to focus on are water selection, proper pH balance during the mash, sparging at the appropriate temperature, good sanitation throughout and finally yeast selection. I hope you enjoyed this week’s article – please subscribe to the BeerSmith newsletter for weekly articles, or listen to my podcast for more great brewing tips. I’d add that even if your temps and pH are in line, grist crush and wort clarity also impact tannin extraction. If you’re getting shredded husk material, you’re more likely to extract excessive tannins. If you get a lot of those grain material into the boil kettle, you can extract excessive tannins that way too. I had a run of about 7 very astringent beers I traced back to shredded husks and poor lautering. I have recently brewed a Festival Landlords Finest Bitter kit. There is a definite smokey taste reminiscent of campfire style foods!!! My question is this, is there anyway to reverse this or must I just pour away 40 pints of bitter?!! I am very careful when it comes to sterilisation of equipment and this is the first time I have experienced this problem so doubt it is my tap water after many previous home brews being successful, I followed the instructions to the letter so am rather upset that I may have to pour the lot away!!! Another great piece, thanks Brad. I recall getting judging comments about phenols, years ago, but thankfully, with improved cleaning and sanitation methods, I’ve not had it lately. I’m impressed with your command of all that chemistry. Keep up the great writing, see you in June! Merely wanna comment on few general things, The website style is perfect, the content material is very superb : D.